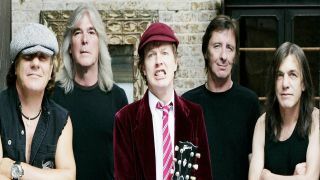 AC/DC singer Brian Johnson has stated the band are not retiring yet – and they're planning to go ahead with studio sessions in May. But his comments suggest there’s at least a hint of doubt about the Aussie giants’ future, and no guarantee that their planned 40th anniversary tour will go ahead. There’s been a flurry of speculation in recent days after it was rumoured that mainman Malcolm Young was too ill to continue, and that a long-standing agreement amongst the quintet meant that if one of them left the entire band would fold. He’d previously confirmed that one of the band, believed to be Malcolm, was suffering from ill health – but he refuses to add more details. “I wouldn’t like to say anything either way about the future,” said Johnson today. “I’m not ruling anything out. One of the boys has a debilitating illness, but I don’t want to say too much about it.